BlueNote has added you as a Friend on Facebook! If you're someone connected in the, well, connected world online, then undoubtedly you've seen more than a few of these email alerts. What they are, for those who have not yet delved, are hopeful "friend" invites into the worlds of various social networks. In the beginning, it's actually quite exciting. It's fun. And it's social value. But, now, after MySpace, Facebook, Twitter, and Jaiku have emerged - as if we needed it - Pownce (another Twitter competitor) surfaces, from the hand of Digg founder Kevin Rose. Another space online in which we need to add more friends and friend more friends? Accept invites and scour the network to find friends? Maybe. And then again, maybe not. That's a more serious statement than it appears, coming from Mr. Arrington - someone, who by virtue of his role, must understand, connect and be connected in virtually every social space online. 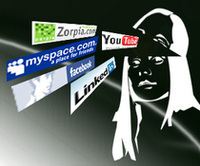 Many, including Slashdot, ZDNet, and a slew of others have been contemplating social network fatigue recently. How much is too much? And what happens once social network fatigue really does set in? Originally guest-blogged at The Daily Galaxy.